The Greatest Showman and the Greatest Ocean Liner! I’m sure that many of you will be familiar with the amazingly successful musical movie “The Greatest Showman” which has done so well over the past year and which starred Hugh Jackman, Zac Efron, Rebecca Ferguson, Zendaya, Michelle Williams and Keala Settle amongst others. A follow-up music album has just recently been released to mark one year since the debut of the movie. Released on November 16, “The Greatest Showman – Reimagined” brings together some of the world’s biggest recording artists to sing their own versions of the music movie’s popular hits. Why am I mentioning this? Well, believe it or not the World Premiere of the The Greatest Showman was actually held on board Queen Mary 2 in New York Harbor on December 8th, 2017!! This is another great example of never knowing what might happen next when you are Captain of the world’s most famous ocean liner! 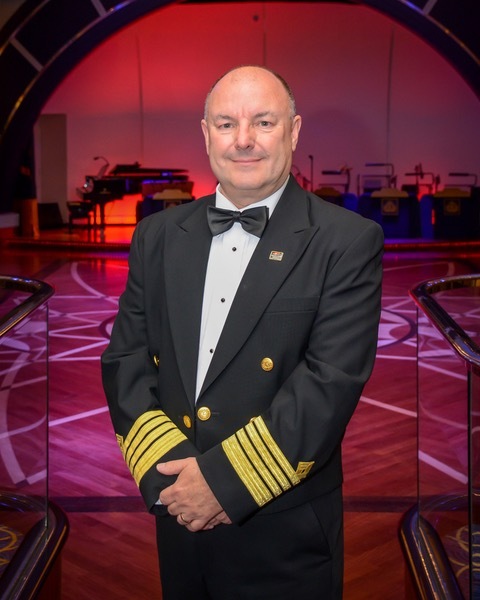 I was happy to be in command of Queen Mary 2 at that time and to host the entire cast of The Greatest Showman and it’s Director Michael Gracey along with Fox Studio VIPs for a reception in the Queen’s Room on board the ship, followed by the World Premiere of the movie in the on board cinema! Amazingly it was actually the first time any of the cast had seen the finished movie; indeed the editing had apparently only been completed just days before. What an experience for my wife and I to be at that premiere and to witness the excitement of the cast as the movie played and they realised what a smash hit it was bound to be! Much whooping and hollering at the best bits and of course after every one of the excellent songs had finished playing! Why was it held on Queen Mary 2? Well, PT Barnum had a strong connection with Cunard, as he used our ships to travel to the UK and Europe with his circus and even with some of his animals! So Fox Studios approached Cunard as they believed an ideal venue for the World Premiere would indeed be on board Queen Mary 2 in New York Harbor! It was of course another usual working day for the ship, as we arrived into New York at 6.00am that morning and sailed again for Southampton at midnight that night, having disembarked 2600 departing guests and then embarked 2600 new guests in the meantime! Not to mention the refuelling of the ship and taking around 50 tons of stores on board as well…. 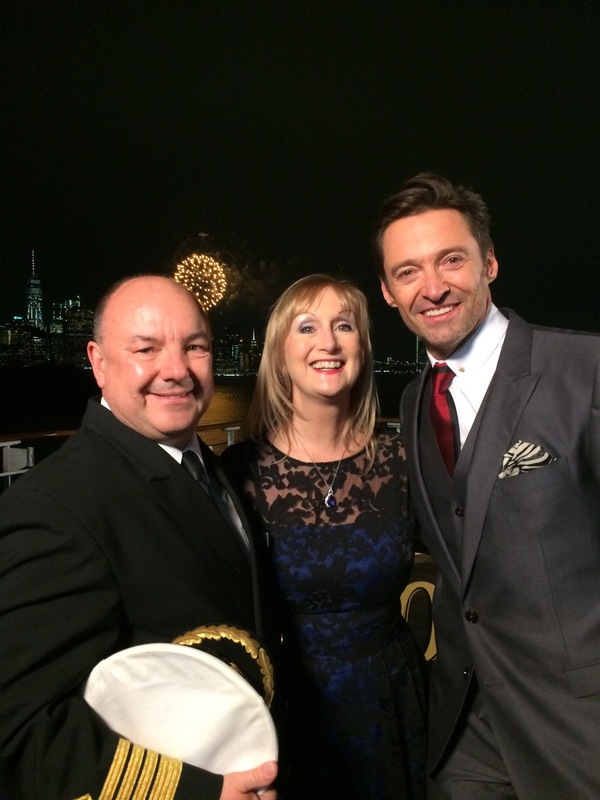 Just another days work on Queen Mary 2, but it was fantastic to meet Hugh Jackman, Zac Efron, Rebecca Ferguson and the others. I have to say though that Keala Settle who played the bearded lady in the movie stole all our hearts! I don’t believe she had ever been on board such a huge liner as Queen Mary 2 and she simply did not want to leave at the end of the evening! Now this next piece has no reflection at all on myself as I write this, but my nautical phrase for this week is another of my favorites, “Three Sheets to the Wind”, meaning to be “in one’s cups” as they used to say in history, or more clearly: drunk…. Yes, this is indeed another nautically derived saying, but the sheets in question are not the sails of the ship as you might expect, but rather sheets are the ropes which secure the sails in position and make sure they fill with wind properly to efficiently propel the vessel through the water. If these sheets are loose and blowing about in the wind, then the sails will flap and the boat will lurch about in the water like a drunken sailor! Seafarers had a kind of sliding scale of drunkenness in which “a bit tipsy” was one sheet to the wind all the way up to the falling over stage which was three sheets to the wind!! Finally for this week, do be sure to take a look at the latest feature on The World’s Greatest Vacations website “Explore the magnificent landscapes of Australia and New Zealand with Cunard”. These cruises will sail in early 2019 (and indeed early 2020 as well) and I cannot recommend them highly enough, as Australia and New Zealand are fantastic countries to visit and really are two of my most favorite destinations. Whatever your plans are for this week, stay safe!